And that was the point. Even at 2:30 in the morning, while drinking, if you are at anchor you should be able to recite the state of the tide and other details. The wind could come up, an anchor could break loose, all sorts of things could happen and you'd better know what's what so as to keep the boat and crew safe. I consulted the tide tables and the chart, did a few calculations, and made my report. "Thanks, you can go back to bed now." I visited Port Madison many times after that and had many nice little raft up parties here. Now I've returned on our big boat, our house in fact. We've come full circle. I knew we had reciprocal moorage available here with the Port Madison Yacht Club so we crept into the narrow bay, dodging all the mooring balls and boats. We found the PMYC floats and headed around the back side to look for the reciprocal dock. Nosing into the crowded assembly of floats, I spotted what I thought was the marked space for guests. It was full. Well, not totally full. There was about 15 feet of open space on the end. So that's where we docked the boat, 15 ft of the bow, with 27 feet sticking out behind. Not bad for free moorage. Last weekend we helped out with the Washington Yacht Club Snooze and Cruise event. Traveler carried a bunch of gear (stoves, grills, awnings, pots, pans and supplies) and had a novice crew of 7 guests aboard. Here are some photos of the crew. While we were not the fastest boat out of the gate, I think we were the most fun boat. Everyone on the boat got to take the wheel and we sailed almost all the way out to Blake Island. I believe the club had 60 people attend with about ten boats of various sizes. On Sunday we returned. Our route took us through the locks and five sets of bascule bridges that had to open for us. After we unloaded gear and crew I felt sad to part from our sweet guests. They lingered then finally left us alone at the dock. A couple of days later Connie and I left the boat in reciprocal moorage at Kingston while we delivered the truck back to Olympia where it will spend the summer under the care of Connie's son, Ezrah. We met with Rick and Ada of the charter business Mystic Journeys on their Islander Freeport 41, Clara June. Over chili we signed a purchase and sale contract and discussed details on how Connie and I were to take over their successful chartering business. We'll come back to Olympia in August and start that transition. So it looks like we've got a nice little business to keep us busy for a while in the oncoming years. Almost all the business is in June, July, August so we'll still have time throughout the year for other adventures. We are psyched! Meanwhile, here we are in Port Madison, a great place to layover between guests. We've got Julie aboard right now. Just met a man on the dock here at PMYC who invited us to come back later today because they are having a race. So it looks like we'll be running across to Shilshole to pick up Dineen and will bring her back here for the race! Maybe we can be the committee boat. Folks are very friendly here. Then on Friday we bring Connie's daughter, Tesla aboard. What we do is nose into the pick-up/drop-off dock at Shilshole and do the crew swap. Let us know if you want to come aboard sometime soon! We are drinking champagne this afternoon because I've just now completed my week long training class to get my US Coast Guard captain's license. It was a tough week, lots of paying attention and studying in the evenings, but it's an (almost) done deal. Just gotta wait for the drug screen ( should be clean ) and the feds to come back with the OK that I'm not in bed with the Russians or something. I can now take out six passengers for hire on our boat, or any other uninspected boat for that matter, and get paid for doing so. It's tough at my age to get thrust back into a learning environment where I have to be perky at 08:00 each morning and sustain my attention until late afternoon. Skip and Jan at Flagship Maritime run a great class here on the Tacoma working waterfront. Without them, I'd be struggling to absorb and regurgitate all that information and then amass all that paperwork to send into the Coast Guard to be considered for a captain's license. Anyhow, happy times for myself and fellow students Scott Tobiason and Steve Neidhardt. 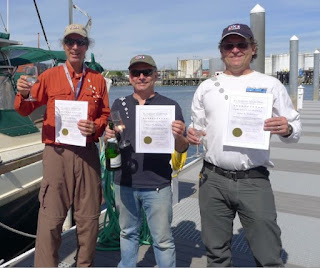 There we are with our certificates and gull poop. While we were toasting, a gull flew overhead and shat on us for luck. Tomorrow we leave Tacoma and sail Traveler to Blake Island, a half day north of here. Then on Thursday we'll negotiate the Ballard Locks and a series of draw bridges to make our way to the UW docks where we'll be participating in the Washington Yacht Club's twice a year sailing and drinking fest called Snooze and Cruise. Saturday morning We'll take on eight passengers at the UW docks and take them all the way out into Puget Sound to Blake Island where we'll have a big steak/salmon feast and a bonfire. The crew will camp there on the Island then the next day after a pancake breakfast we'll all sail back to the UW. This is an event I've attended in the past and I've always been a passenger. This time I'll be Captain of my own ship. It's the completion of a big circle for me and a time to pay it backward, so to speak. For those of you in the Seattle area, Traveler will be near there over the next two weeks or so and we'd love to have you out on the boat. So please get in touch and we can rendezvous on the water, say Kingston, or Bainbridge Island, or Shilshole Bay.